Louisiana is known for it’s Monday ‘s Red Beans & Rice Day but do you know why? Leave it to clever New Orleans housewives. In the 19th century, Monday was laundry day in the city. Without washing machines, the ladies of the house had to clean every dirty article of clothing by hand! This didn’t leave much time for cooking, so dinner had to be something that could cook by itself. 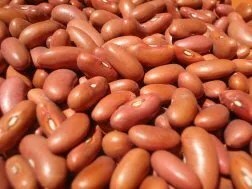 Enter the red kidney bean, brought to New Orleans by those fleeing Haiti’s slave rebellion. The beans needed to soak overnight before cooking, but these days, you’ll find a “quick soak” method on the back of the package. After soaking and draining them, housewives simply set the beans on the stove with fresh water to boil until tender, and then added a delicious helping of sauteed “trinity”–the quintessential Cajun/Creole cooking base of diced onions, celery and bell peppers. From here, it’s traditional to throw in Sunday dinner’s ham bone, letting it flavor the beans along with a bay leaf. You can omit the meat, or add in some andouille sausage or tasso ham while your rice cooks up. I make an easy method by using the crock pot & let it cook all day. Optional: Soak the beans overnight Rinse the beans under cool, running water. Place in a large bowl or pot and cover with several inches of clean water. Let sit overnight. Drain before cooking. Once done, remove the skillet from heat and transfer the contents to a slow cooker. After eight hours (on low setting ) or three hours (on high setting) the beans should be soft. Use the back of a spoon to mash some of the beans against the side of the pot to thicken the beans, for a more creamier style of beans. This entry was posted in louisian, Monday's Recipe and tagged blog, family, local. Bookmark the permalink.